One of the major advantages to living in the digital age is how much knowledge we have access to. Media definitely has its burdens and flaws, but it also has the power to embolden our faith! Drive Thru History® – “The Gospels” is the latest project from Drive Thru History® with Dave Stotts and one of those tools that can be used to teach and build up our family and friends toward a better understanding of the Bible. One of the first questions a person might ask when introduced to the gospel is usually about how we can trust the Bible to be true. This entire series touches on many ways to answer that question. This has certainly been one of those reviews that the adults benefit just as much as the kids! 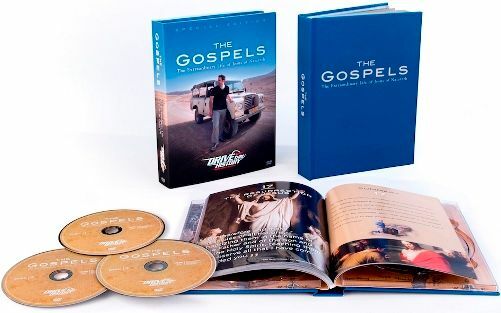 Drive Thru History® – “The Gospels” is a series of 18 30 minute episodes over 3 DVDs where Dave Stotts travels to all the locations mentioned in the gospels that housed Jesus' birth, life, death and ministry. 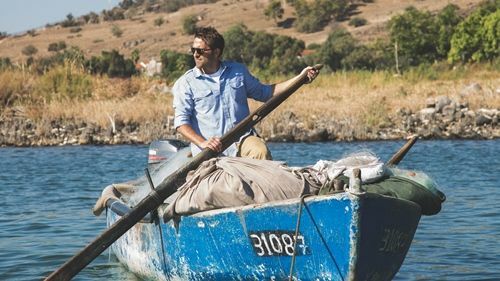 There are over 50 ancient sites he visits and utilizes history, archaeology, geography and art to bring the story to life. As students of the Bible we all picture in our mind what events looked like, but at best come up short with a good visual because we just weren't there. Visiting, albeit virtually, the places where these things really happened sets our understanding on a whole new level and certainly builds up our faith. Also included in this set is a study guide corresponding to each episode that can be used in a variety of ways. The study guide provides a summary, recommended scripture reading, discussion questions, beautiful graphics and bonus information under the heading 'Side Road' for each episode. The recommended age of this series is 5th grade to adult, but families are encouraged to watch them together too. Since the children in our family are 6 and under, we simply watched episodes together and not as a specific study. However, when using the study guide, this quickly turns into a massive bible study tool. For homeschooling families, this could supplement a major history, geography or Bible study. It could also be useful for church groups or even just studying with your friends and neighbors. Drive Thru History® provides a great springboard opportunity to discuss all aspects of the gospel with others from a unique perspective. As a parent and teacher of small children, I'm excited to have this in my library. Almost like a digital encyclopedia, this set provides multiple layers of information to be dissected and used. It's been fun to watch now, but it will also be useful to pull from as my kids get older and much of it becomes more relevant to their own understanding. Drive Thru History® sure did a great job!